Medical imaging is often provided by the HIS or a PACS server. In many cases, however, it may be more desirable to store imaging in the context of the ENT specific data repository. Moreover, PACS systems often do not allow video playback at sufficient frame rates (e.g. for stroboscopic video recordings). Audiqueen therefore provides high performance storage and visualization/playback of images, audio and video. Typical screen showing the results of images or movies. Here the user has chosen to group all these results under one test type ‘endoscopy’. Thumbnails depict the underlying image or movie. The original can be viewed by clicking on the thumbnail button. 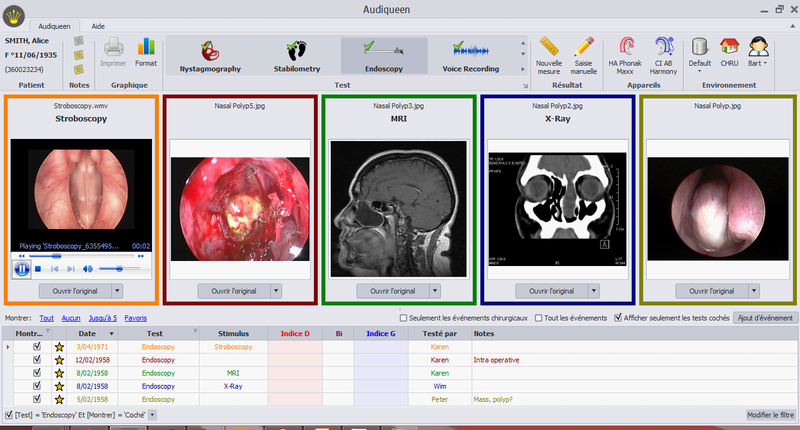 Audiqueen contains a video capture module that allows recording video and saving images from the output of a video endoscope/stroboscope. In the absence of an auxiliary video output, the signal is split by using a professional adapter. This way the video image can be displayed and recorded in Audiqueen while it remains visible also on the original monitor. The use of an optional foot pedal is complementary to the keyboard and enables hands-free recording of specific video fragments and taking high resolution snapshots of the image. This way the ENT physician’s focus remains with the manipulation of the actual scope hardware. Video recording typically requires high volume storage facilities. For this reason, many settings are available to optimize the image quality in function of disk space requirements: bitrate, framerate, video codec, resolution, etc. Audiqueen can capture and store the audio signal from a microphone input of the PC.